(Photo: REUTERS / Bogdan Cristel)Members of Armenian community in Romania hold banners during a rally marking the anniversary of mass killings of Armenians in Ottoman Empire in 1915, in downtown Bucharest April 24, 2012. 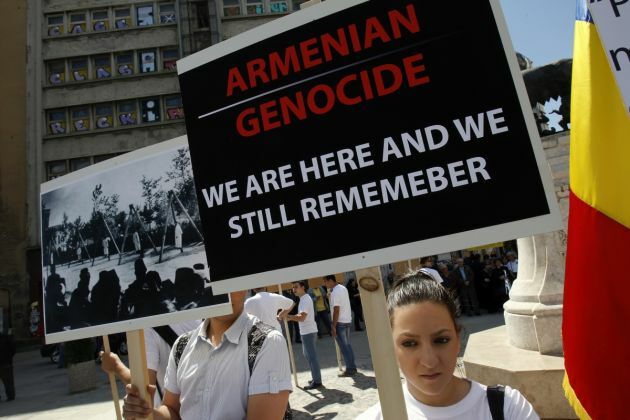 Armenia, backed by many historians and parliaments, says that about 1.5 million Christian Armenians were killed in what is now eastern Turkey during World War One in a deliberate policy of genocide ordered by the Ottoman government. Successive Turkish governments and the vast majority of Turks feel that the charge of genocide is an insult to their nation. Ankara argues that there was heavy loss of life on both sides during fighting in the area. Leaders of the Armenian Apostolic Orthodox Church marked the 99th anniversary of the start of the Armenian Genocide with calls for recognition of that historic event. Beginning in April 1915, more than one million Armenians were killed by troops of the Ottoman Empire, with its capital in what is now Turkey. Karekin II, the Supreme Patriarch and Catholicos of All Armenians (Oriental Orthodox Churches), and Catholicos Aram I of the Holy See of Cilicia, based in Lebanon, presided at separate anniversary events honouring those who suffered as martyrs, the World Council of Churches said in a statement. The World Council of Churches is planning a major conference on the 100th anniversary of the Armenian Genocide on 24 April 2015. The Turkish prime minister, Recep Tayyip Erdogan, had on April 24 offered his condolences to the families of more than 1 million Armenians massacred during the World War I, in what were viewed as Turkey's most conciliatory remarks yet over the killings. In a speech shortly before the 99th anniversary of the start of mass deportations of Armenians, Erdogan described as "inhumane" the mass killings by then Ottoman forces that were in many quarters as the first 20th century genocide. But Aram responded on April 24 by saying, "Armenians do not want sympathy or mercy from the Turkish authorities; they demand the recognition of the Genocide and Reparations." He said that Turkey had transformed Armenian churches into mosques, restaurants, factories and parks. "In order to placate the West, the government of Turkey has transformed a few churches into museums." Noting that "the genocide continues," Aram said that in order to force Armenia and Armenians into negotiating on its own terms, "Turkey is cooperating with Azerbaijan in imposing an economic blockade on the state of Armenia." At a mass in Antelias, Lebanon to commemorate the genocide Aram said, "As Armenians in the diaspora commemorate the 100th anniversary of the first Genocide of the 20th century, the international community should understand that the genocide continues today in different forms." At another commemoration mass in Armenia, Karekin II said that the martyrs' pain was inflicted deliberately because of who they were, contrary to the position of those who perceive their suffering as an unfortunate side-effect of general suffering during the First World War. The online news source Havern Aysor quoted the patriarch warning that "denial of the truth is a heavy burden not only on the denied, but the denier as well. The truth can be concealed, but never forgotten or lost." Earlier in April, at an international conference in Lebanon, Aram I spoke of the need for Armenians throughout the world to observe next year's 100th anniversary as a united people. "Unity must become the driving force for all Armenians," said Aram, a former moderator for the WCC's main governing body, its central committee. "It's obvious that Armenia and all Diaspora Armenian communities will hold events according to their region and conditions. But we must take measures to make this a pan-national event." Aram I stressed that the goals of remembrance must include both "recognition" of the genocide and "reparation" for losses of the past hundred years. Last year, on 24 April 2013, Karekin II and Aram I took the unusual step of issuing a joint statement on the Armenian Genocide urging Turkey to return confiscated Armenian churches and church estates. The statement came as an appeal uniting the voices of the two primates on an issue of great importance to their churches in Armenia and the diaspora. "In 1915, more than 1.5 million Armenians became victims of genocide. The survivors on the roads of exile found shelter in Eastern Armenia, the present-day Republic of Armenia, Syria, Lebanon and other Arabic nations, and in a number of other countries of the world," the statement said. Karekin II and Aram I demanded that the government of Turkey recognize the killing of Armenians as genocide. They demanded that the government in Turkey return all of the confiscated churches, church properties, monasteries and other relics to the Armenian churches, and compensate those Armenians who have suffered because of the genocide. The Turkish government has never recognized the Armenian Genocide, despite governments around the world, including the EU and United States, recognizing the killings as genocide. At its 10th Assembly held in Busan, Korea in November, the WCC pledged that it would hold an "an international conference in Geneva on the recognition of and reparation for the Armenian Genocide." Both Armenian churches are member churches of the World Council of Churches. Patriarch Karekin II is one of the eight recently elected presidents of the WCC. He was elected by the 10th Assembly as president for the Oriental Orthodox churches of the WCC. Catholicos Aram I was the longest-serving, moderator of the WCC Central Committee, having served in that office from 1991 to 2006.